Fans used for ventilation and air movement work by one of two different methods. The most common is the axial or propeller fan, similar to those used on stands for moving air in a room or used in computers for cooling power supplies. They can move large volumes of air at very low pressures. The other type is a centrifugal unit, and these are similar to a centrifugal water pump. They have a plate with radial vanes and the air is forced out by the centrifugal force. These are either an in- line fan, where the air goes straight through parallel to the fan shaft, or the other type is the "squirrel cage" fan where air is drawn into the centre of the fan and exhausted through the side casing, perpendicular to the impeller axis. The latter is rarely used in domestic fans. Axial fans are the most common, as they are the cheapest to produce and more compact. One disadvantage they have is that they cannot develop high pressures, with a limit around 60Pa-80pa for household sizes. Centrifugal fans with the same size inlets as axial fans can develop pressures up to 4 times that of an equivalent axial fan, however, they also usually cost a minimum of twice that of an equivalent axial fan. Fans can either be surface mounted or in-duct, where it is in the middle of a duct run. Fan Curves On a few fans, we show a graph of airflow vs static pressure (back pressure, sort of). This means that if you have a certain pressure that the fan is pushing or pulling against, then you know the likely airflow rate. Please click HERE for more details on fan curves. Ducting The usual materials for ducting are either a steel spiral sheetmetal rigid pipe or a flexible PVC or aluminium foil tube supported by spiral steel wire. The latter is easiest to install and is cheap, however it is very restrictive to airflow. The steel pipe requires special tools to be installed properly, which most homeowners or plumbers do not have. The most common fault is to chose ducting which is undersized for the fan capacity, and this increases the noise of the system through the higher air velocity and also increases the friction in the system, which makes the fans work harder or require them to be larger than necessary. Duct sizes should generally be kept as large as possible A small difference in diameter makes a huge difference to the amount of restriction, as the back pressure from friction losses is inversely proportional to the power of 4. Let us take the example of an inline fan in the ceiling: If we assume that the peak pressure of the axial fans in a heat and light fan units is around 60Pa and a peak flow rate of 70l/s in free air with a more or less straight to circular curve between the points (see below). (or maybe from the manufacturers data) We also make some other assumptions: The exhaust grille (and intake if it has one) is 10-20Pa pressure loss. We have 2 bends, an exhaust grille, and an intake grille, as it is part of the fan and hence part of its quoted performance. The duct length is 3m. Our pressure loss is 15pa for each grille + ((3m+2*1.5m per bend)*2 Pa per metre) = 30+ 12 =42Pa. We know look up our fan curve for 42Pa static pressure and read off the amount of air being moved from the bottom axis. 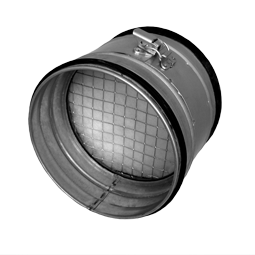 At the very minimum, the duct size should be at least a large as the size of the fan, i.e. a 150mm fan uses 150mm ducting. Most Sound levels are rated in decibels, measured at 3 meters. (Although some manufacturers on their data sheets state dB@ 1.5 meters. In these cases we have converted to @3m by subtracting 6dB.) Be aware that some fans give noise ratings in SOUND POWER LEVELS, also in decibels, which is a different measure and is normally about 21 decibels higher than the Sound Pressure @3m measurement. An important thing to remember is that they are logarithmic, which means that they do not go up in a linear (straight-line) fashion, rather it is exponential. This means that a (more or less) 10db increase is twice as loud. A 2-3 dB difference is considered to be a just noticeable to most people, although this varies. The search for the silent/quiet extractor fan. Many people want to upgrade their current extractor fan with a quiet version, as most cheap bathroom fans are quite noisy. There are a number of options available. Firstly, it depends on the duct length. If its only a matter of 3-5 meters, the TD range of mixvent fans will suffice. These are a half way house between an axial fan( suitable for short duct lengths) and a centrifugal fan (suitable for long ducting lengths) and and very quiet. Examine the dB readings on the datasheet for comparison with others. If a more powerful extraction is required, a centrifugal fan is a must. In this case, our range of Acoustic fans are as quiet as you can get. They have sound insulation inside the box to absorb noise. They are also very powerful and easily cleaned and suitable for domestic/industrial applications where sound levels are a problem. To absorb any noise from the rushing of air, rather than the fan chassis breakout noise itself, use acoustic ducting and/or a silencer at the input/ output. These are just hollow tubes, acoustically designed to absorb the white noise you get at the end of ducting. Using one of these solutions will normally solve any noise problem. 3/ Use a larger fan but turn it slower. This can make a big difference, as the noise varies with the square of the fan tip speed. 4/ Try using "acoustic ducting". Building regs (BS7671 the Requirements for Electrical Installations) state, in section 601 that any devices in Zone 1 of a bathroom must be running on a low voltage, normally 12volts. This normally means putting the transformer seperate in Zone 3. ALTHOUGH other building regulations also say anything IPX4 and above (where the second digit of the IP rating is 4 or more) can be used if protected with a 30mA RCD. Zone 1 is defined as the area around the bathtub or shower basin up to a height of 2.25m above the floor and at a radius of 1.2m from the water outlet. We have had many customers inquiring about how to cool a server room using fans. The answer is obvious, LARGE airflow and when calculated correctly, an extract and input fan system can cool a server room for much less money per year than using air conditioning units AND move some useful warm air to other areas needing heating or even better, a heat recovery unit. This saves money and CO2 emissions yet again and contributes to a greener future by using as energy efficient a system, as possible. For the technically minded, a very useful residential duct systems design paper. Download HERE. Read our WEEE ((Waste Electrical and Electronic Equipment) regulations) policy HERE.